Norwood's retail shops have historically been located in the main business district on Montgomery Road or scattered about the many neighborhoods. Each shop had its own entrance and in the business district the shops were usually on the first floor of a multiple-story building. When shopping malls or centers came into the area, the situation changed. The automobile made it more convenient to shop at these centers — no parking fees, less congestion or other hassles and a large selection of shops. 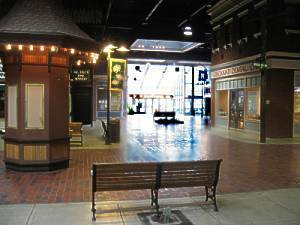 The nearby malls at Swifton (the first open-court shopping mall in the Greater Cincinnati area in 1956), Kenwood Plaza (which also opened in 1956) and Hyde Park (which was actually located in Oakley) hurt the small shops in Norwood and other communities. 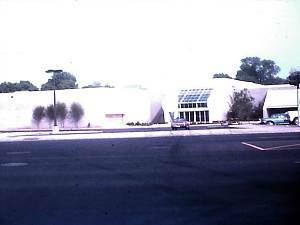 Large malls (such as the first enclosed mall in the Greater Cincinnati area, Tri-County Shopping Center, which opened in the fall of 1960) probably caused some loss of business for Norwood, also; but, it really started taking shoppers away from downtown Cincinnati. At first, the shopping centers were exterior or "strip malls." Norwood's first center—the Norwood Plaza—was of this type. It was constructed at the Schreiber property, an old steel and ironworks factory site. 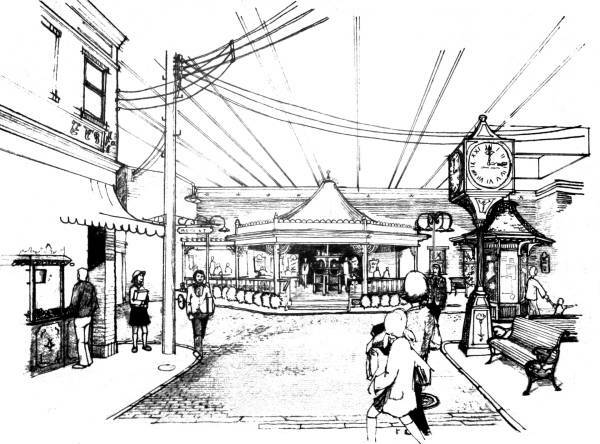 In February, 1966, at the first rumors of the planned mall, there was concern about the impact it would have on Norwood's central business district as well as the 1963 Urban Renewal plans for a new shopping center in the center of Norwood—initially called Nor-Center, but before construction was renamed Surrey Square. 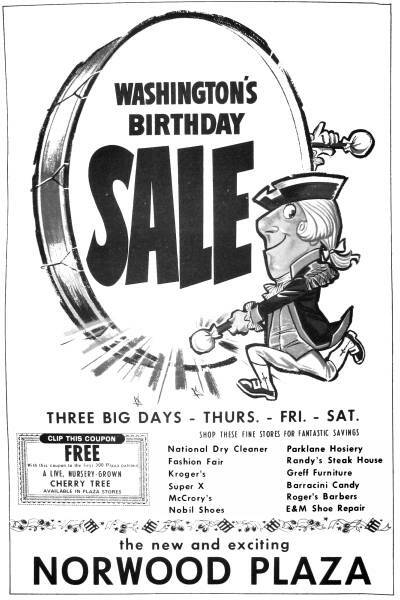 As this 1968 advertisement shows, the Norwood Plaza stores were: National Dry Cleaners, Fashion Fair, Kroger, Super X, McCrory's, Nobil Shoes, Parkland Hosiery, Randy's Steak House, Greff Furniture, Barracini Candy, Roger's Barbers and E&M Shoe Repair. In 2009, Xavier University acquired the property and demolished the western strip section. The northern strip remains. 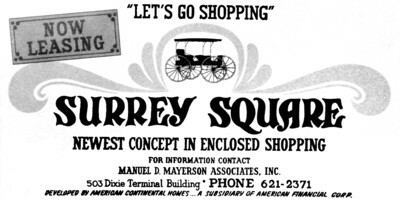 The second Norwood center was Surrey Square, in the heart of the original shopping district. However, it was different than Norwood Plaza, since it was designed to have an enclosed central mall where many of the stores were located. 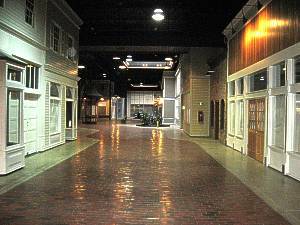 Eventually, many of the old shopping centers in the region changed to enclosed malls, e.g. the old Kenwood strip, now Kenwood Town Center. The current idea is exterior entrances to each store — again! 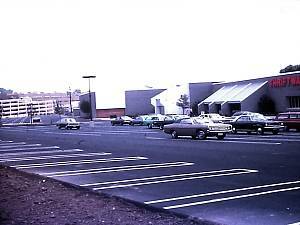 The original Kenwood Mall, now Sycamore Plaza at Kenwood, changed from an enclosed mall years ago. Today, Surrey Square is in the process of doing the same. The "life-style centers" are similar, but, with an upscale slant. Its no more strolling down a street or inside an air-conditioned mall checking the various shops. Now, the customer wants to drive close to the door of the shopping destination, run in, buy and get out. Nor-Center as it was proposed in 1963. 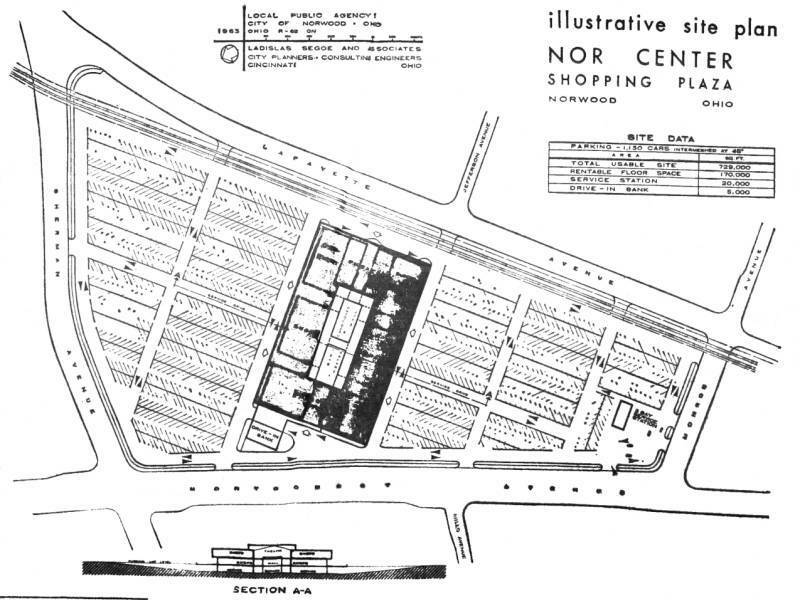 This proposed shopping center, called Nor-Center, was conceived by Ladislas Segoe and Associates and others, as Norwood's Urban Renewal Project No. 2. As you can see, it would be on the same land that Surrey Square would occupy. But, instead of being spread out, it would be concentrated into the center of the site. The mall would be 170,000 square feet of rentable space with a parking lot for 1130 cars. The first level containing service facilities for the mall, would be underground. On the west side (facing Montgomery Road) would be a two level department store. On the east side (facing Lafayette Avenue) would be two supermarkets. Above the grocery stores would be a theater. Inside would be various shops. The mall would be completely enclosed and would be used for access to the shops and to provide an area for shows, exhibits and special events. Near Montgomery Road, in front of the department store would be a drive-in bank and over that a restaurant. At the south end (Monroe Avenue), a 5-bay service station was shown. Surrey Square as it was proposed in 1969. Notice the never-built tall building at the far end. Sign at the construction site of Surrey Square. "DEVELOPED BY AMERICAN CONTINENTAL HOMES ... A SUBSIDIARY OF AMERICAN FINANCIAL CORP."
Surrey Square construction site after demolition of existing structures. 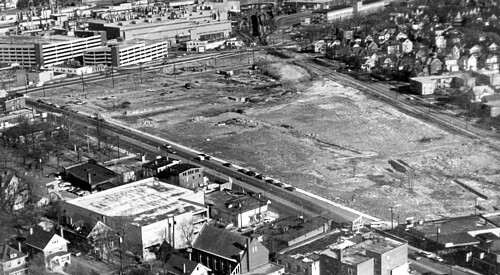 The site is bounded by Montgomery Road on the west (left), Lafayette Avenue on the east (right), Monroe Avenue on the south and the then new extension of Sherman Avenue between Montgomery and Smith Roads (near intersection with Lafayette) on the north. Note the General Motors Plant (now the Central Parke shopping and business center) and the multi-level parking garages at the top of the photo. 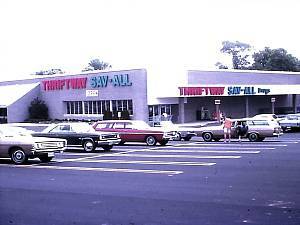 Left photo: Thiftway Sav-All supermarket and pharmacy at the south end of Surrey Square. Right photo: View of rest of Surrey Square, looking north. The General Motors parking garage is visible in the background. Left photo: One of Surrey Square's mall entrances. This one, just north of Thriftway, opens into the south end of the mall. 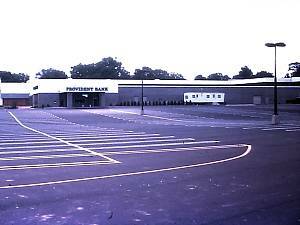 Right photo: Front of the Provident Bank, owned by the developers of the shopping center. This is at the north end of the mall. Later Central Hardware would open to the right. 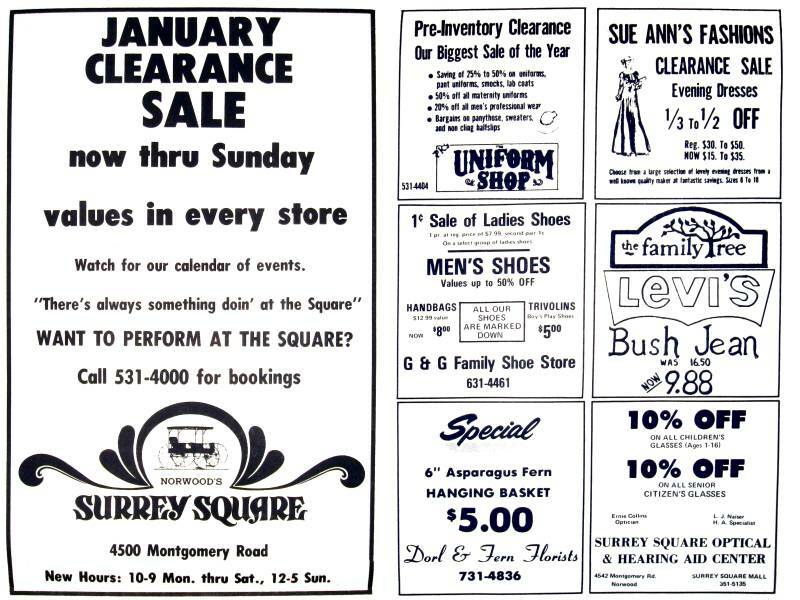 Surrey Square advertisement from January 1976. Note, the offer to allow use of the center for performances. The large interior common area allowed for exhibits, performances and other community activities. The photograph on the left is looking north, towards the center of the mall. Located at the far end was Media Play and before that Central Hardware. (Does anyone remember the rumors, when Surrey Square was being built, that a theater was going to occupy that space?) The photo on the right is looking west to the main entrance (toward the parking lot and Montgomery Road). A large sketch retrieved from a Surrey Square office before demolition of the shopping center. This was probably an early vision of the mall's main public area. A new developer has made many changes to the old mall, but has retained the name Surrey Square. Almost all of the old mall has been demolished and replaced with new buildings. The structural steelwork of the old supermarket (originally Thriftway, but later Kroger, which has moved to the north end of the mall at the location of the old Central Hardware/Media Place stores) is basically all that remains. The mall is no longer enclosed and each store has its own entrance.